It is a common feeling in the military that the quality of ones service is directly related to how far away from the flagpole you are. This translates in the civilian sector as to how often upper managment looks over your shoulder. Bagram Airfield is the location of CJTF-76, a very large flagpole. Underneath it are Regional Commands (brigades) then Provincial Reconstruction Teams and Foward Operating Bases (Battalions). 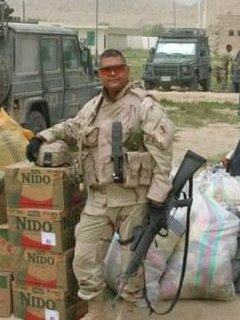 Last time I deployed downrange I was at a brigade HQ in Kosovo (Camp Bondsteel). I was literally chained to my desk churning out spreadsheets and Powerpoint slides. Did I hate my job? Yes and no. I never got to go anywhere in the Area of Operation (AO) except for a once a week trip to Pristina for a meeting. There were amenities on Bondsteel that made life pleasant. Bondsteel and Bagram share many of the same amenities. Both have PX's, Burger Kings, coffee shops, vendors hawking souvineers, barbers, alteration/press shops, workout facilities, movies, free laundry and food (thank you KBR). Bagram, because of the immense size of its flagpole, has a Dairy Queen, a Subway, and a beauty shop/spa that offers professional masseuse services. I, along with my colleagues visited the HQ today. Unofficially the place is called the Puzzle Palace (it is a bunch of containers connected together Leggo style inside a hangar). As you can imagine, Puzzle Palace is loaded with many meanings. One wag called the place the venue for the OER Olympics (Officer Evaluation Report). Already, I know that I want to be assigned to a location that is the farthest from this place. I don't care about the Dairy Queen or the masseuses. All I know is that I already did one tour at an HQ and I don't want to go through that mess again. Send me down range to where the boots hit the ground and I will be a happy camper, hopefully soon!